A Spotify playlist’s theme is limited only by your own imagination. For example, you could put together a playlist that evokes memories of a backpacking trip throughout Europe in 2000 and then a move to London — music heard in hostels and pubs, albums bought on CDs, and bands you saw live. To choose tracks, browse local files to see whether anything you bought back then stands out, and then add tracks that bring back memories to the playlist. 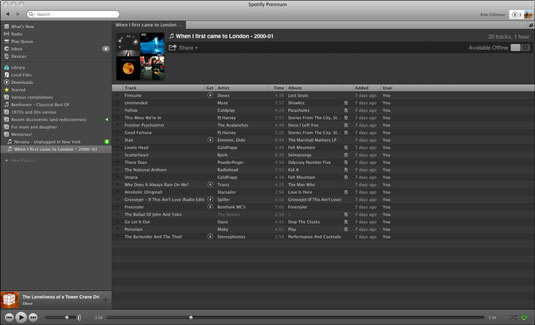 You also can conduct a Spotify search on the most popular tracks from the years 1999 to 2001. How you choose tracks for your playlist will probably be unique and depends on the theme of your playlist. Your creativity can really shine here! Playlists can consist of any kind of songs, ones dedicated to contemporary classical music, Christmas playlists, playlists for girlfriends and boyfriends, personal top album picks of the year — you name it. Click New Playlist, located at the bottom of Spotify’s left sidebar. New Playlist turns into a text box. Type the name for your playlist in the text box, and then press Enter to confirm your selection. You can always change your title later. After you come across a song that you want to add to your playlist, just drag and drop that track onto the playlist title. 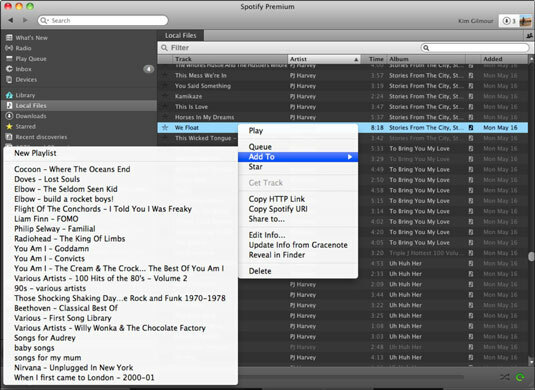 Alternatively, right-click the track (Ctrl-click on a Mac) and select Add To from the pop-up menu that appears to bring up a list of your existing playlists. Select the playlist to which you want to add your track. (You can select New Playlist from this list if you want to add it to a completely fresh playlist; then, give the playlist a name later). Click your playlist name on the left sidebar. Your new playlist appears in Spotify’s main pane. A selection of albums from the track listings are displayed as the playlist’s artwork. You can change a playlist view by going to View→View as Album List or pressing Ctrl+G. This selection lets you view the album cover art next to all the playlist tracks. It looks very pretty but can take up a load of valuable screen space. To resize the album art, click and drag the right-hand side of this column to the left or right. You might want to keep your playlist private for now. But if you want to share your playlist, you have a number of ways to publicize your superb creation and get it noticed by the world. Now, you can play your favorite tracks and come back to them every time you start up Spotify!